Here in America we have twenty-four shopping days in December until Christmas, but in Italy, the holiday season starts a bit earlier, lasts a bit longer and is sprinkled with more official celebrations. In fact, there are five holidays other than Christmas and New Year’s which are part of Italy’s stagione natalizia (Christmas season). What exactly are all the festivities about, and what might you celebrate if you find yourself in Italy in December? Read on for details. This day celebrates Saint Nicholas, patron saint of the southern Italian port city of Bari (and birthplace of my Italian grandfather). San Nicola is also believed to be the man who inspired Santa Claus traditions around the world. His relics are kept in the basilica in Citta` Vecchia, the old section of Bari, and early morning on December 6 (sources tell me 4:30 am mass! ), the faithful come from near and far to pray at his remains. My cugini da Bari (my cousins from Bari) say that, following an old tradition, the day is celebrated by drinking hot chocolate. If you are named Nicola, this is your onomastico, or feast day, and you might have your hot chocolate in a cafe` with friends. In other cities, children leave an empty plate on their table the night before, and in the morning, the plate is filled with chocolates and goodies. This public holiday remembers the conception of the Virgin Mary in her mother’s womb, St. Anne. In addition to elaborate processions across the country, L’Immacolata Concezione marks the official start to the Christmas season in Italy, and many Italians begin decking their halls on this day. My cugini say this is a day to get together with family, decorate the tree, do a little Christmas shopping at the local street markets (i mercatini), and eat panzerotti, all of which sound like a lovely way to start the season. Panzerotti are a specialty of Bari, and I can attest to the fact that you never want to miss an opportunity to eat this little pockets of deliciousness. Some of my cugini gather the night before and celebrate with a meal of cavatelli. (There seems to be a theme here…) Knowing my family, the pasta is probably homemade and covered with steaming, mouth-watering sauce, also fatto in casa (literally, made in house). These don’t technically count as part of our list of five, but I didn’t want to leave them out. Plus, now you know the names in Italian for these holidays. Catholic tradition names Saint Stephen as the first Christian martyr and his feast day, according to sources, marks the announcement baby Jesus’ birth and the arrival of the three wise men. San Silvestro, Saint Sylvester, was a Roman Christian who served as pope from 315 until his death on December 31, 335. Traditional San Silvestro foods include lentils, which symbolize money and good fortune for the coming year, and pork, to represent the richness of life. Finally, exactly one month later, the holiday season (stagione natale) concludes with Epiphany. 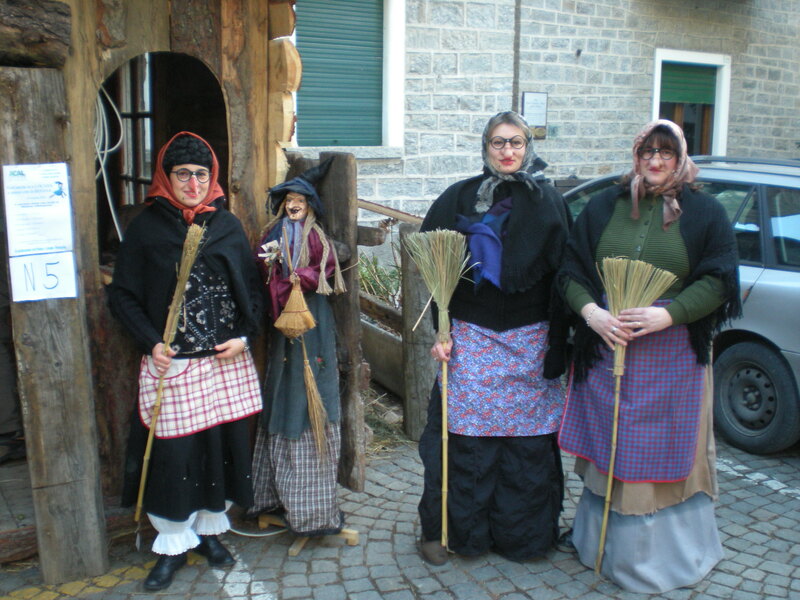 While Italian children hope that Babbo Natale (Santa Claus) will find them, they also believe in La Befana, an old witch-looking woman who rides a broom and delivers presents on the night before Epiphania, which is celebrated January 6. Still on my wish list is to spend one December in Italy, celebrating the traditions with my family. A whole month of festivities, food, family — it’s not what I’m used to here in the states but, when in Italy….or however the saying goes. Buon Natale a tutti! Merry Christmas, everyone! This post, pulled from the archives, first appeared on Prayers and Piazzas. Tags: Christmas in Italy, Italian Christmas holidays, Italian Christmas traditions, Italy, Travel. Bookmark the permalink. And, just for the record. I’ll never understand Epiphany. Not that I haven’t tried. Maybe we should have lunch, and you can explain it. It’s difficult to weather this season as a person of Anglo-Saxon-Dutch-Scottish heritage with only a spiritual connection with Italy. There are no official feast days for me, but so much to celebrate. Grazie!